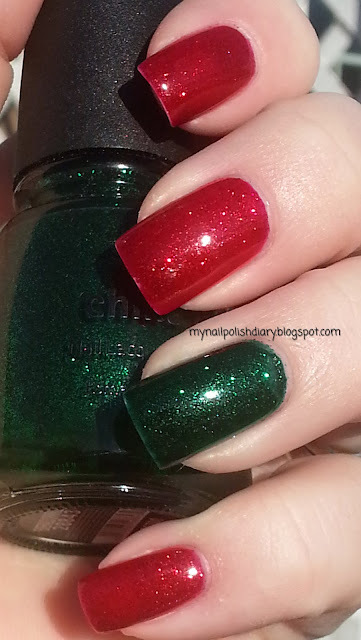 For me, it isn't the Christmas season without China Glaze's amazing Ruby Pumps and Emerald Sparkle. I decided to pair them for what turned out to be a stunning mani. China Glaze really knows how to make a beautiful glass fleck polish. It's kind of their thing. I'm pretty sure they pioneered this finish. If they didn't they definitely set the bar. I can't go through Christmas without wearing each of these and I think pairing them for this mani was a total win! 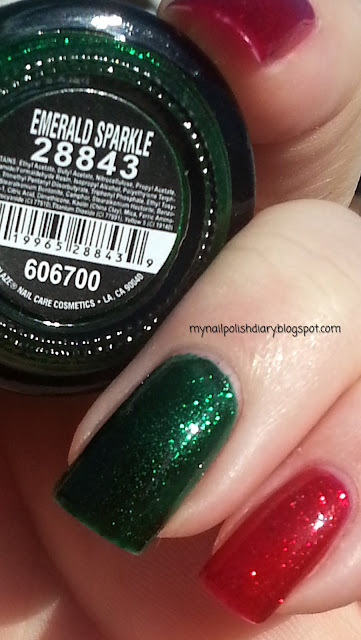 Emerald Sparkle was released in 2008 with the Sleigh Ride Collection. Ruby Pumps was released in 2009 in the Wizard of Ooh Ahhz Collection, but I am pretty sure it's now part of the core collection. I am going to do these right now - I need a polish change and pulled Emerald Sparkle 2 days ago - now need to look at my database and find where is a good shot that I will find my Ruby Pumps bottle! Agree totally - both are gotta haves on your piggies or hands over the holidays. I am glad I tracked down Emerald Sparkle since I did not buy it when it was released. it's the pretties of all my sparkling greens and I get more compliments on it than any other green I own. I totally agree Emerald Sparkle is the best green sparkly ever. I absolutely love it. I got several compliments with this mani. Hope you had fun with it. Thanks for looking!